Adolf Hitler, the Austrian-born German politician and the leader of the Nazi Party, hailed from Ranshofen, a small village in the municipality of Braunau am Inn, Austria. He was born on April 20, 1889, the fourth of six children of a minor customs official, Alois Hitler – and Klara Pölzl. At age three, Adolf moved with the family to Passau, Germany, but remained there only two years before locating in Leonding, near Linz, Austria. This early traveling between the two countries helped Adolf later adopt the feeling that he was more German than Austrian. Hitler’s father, Alois Hitler, was the illegitimate child of Maria Anna Schicklgruber. The baptismal register did not show the name of Alois’ father, so Alois received his mother’s surname. In 1842, a Johann Georg Hiedler married Maria Anna. After she died in 1847 and he in 1856, Alois was brought up in the family of Hiedler’s brother, Johann Nepomuk Hiedler. In 1876, Alois was legitimated and the baptismal register changed by a priest before three witnesses. However, many in the family – and others as well, although they kept quiet – were convinced that Maria Anna, Alois’ mother, was employed as a housekeeper for a Jewish family in Graz, Austria and that this family’s 19-year-old son, Leopold Frankenberger, had actually fathered Alois. If true (and many prominent historians disbelieve this assertion) that would make Hitler – who hated all Jews and wanted to exterminate them – a quarter Jewish himself in the Nazi way of determining race. In June 1895, the Hitler family moved to a small landholding at the village of Hafeld near Lambach, Austria, when Alois retired from customs and tried his hand at farming and beekeeping. Young Adolf attended school at the village of Fischlham. However, he rebelled against the school discipline, as well as that of his father, and began to emotionally separate from members of the family. With the farming attempt in shambles, Alois moved the family back to Lambach and a year later to Leonding. In February 1900, Edmund, Adolf’s younger brother, died from measles, which further pushed Adolf to being a sullen and detached boy, constantly bickering with his father and schoolteachers. That September, Alois sent Adolf to the Realschule in Linz, Austria, hoping the son would become a customs bureau employee. This event soured Adolf further, as he had wished to become an artist and attend a classical high school. His schooling declined, when on January 3, 1903, Alois suddenly died. Adolf transferred to the Realschule at Steyr, Austria for a year, before leaving school completely. From 1905 to 1913, Adolf lived in Wien, Austria. Following a bohemian lifestyle, he was financed by orphan’s benefits; his mother also supported him. During this time, Hitler worked as a part-time laborer and eventually as a painter of watercolors. The Academy of Fine Arts, Wien, rejected Hitler for admittance in 1907 and 1908, because of his inaptitude for painting, and the academy’s director suggested that Hitler study architecture. Klara Hitler died on December 21, 1907, an event that crushed Hitler’s spirit. Running out of money, he lived in a homeless shelter in 1909 and by 1910, he had settled into a house for poor working men. He probably began his virulent Anti-Semitism at this time. Hitler left Austria in February 1914 and moved to München. At the outbreak of World War I, Hitler volunteered to serve in the Bavarian Army as an Austrian citizen. He was assigned to the 1st Company of the 16th Bavarian Reserve Infantry Regiment “List Regiment” and served as a dispatch runner on the Western Front in France and Belgium. He was in combat at the First Battle of Ypres, the Battle of the Somme, the Battle of Arras and the Battle of Passchendaele (Third Battle of Ypres.) He was soon decorated for bravery, receiving the Iron Cross 2nd Class in 1914. During the Battle of the Somme in October 1916, he was wounded in the groin area and left thigh by shrapnel from an artillery shell that exploded in the dispatch runners’ dugout. He subsequently spent almost two months in the Red Cross hospital at Beelitz, not returning to his regiment until March 5, 1917. Hitler received the Iron Cross 1st Class on August 4, 1918, having previously received the Black Wound Badge on May 18, 1918. On October 15, 1918, Hitler was temporarily blinded in a mustard gas attack and was hospitalized in Pasewalk. At this hospital, he received word of Germany’s defeat, and suffered a second bout of blindness. Now a decorated veteran of World War I, Hitler joined the German Workers’ Party (a precursor of the Nazi Party [NSDAP]) in 1919, and became the leader of the NSDAP in 1921. On November 9, 1923, Hitler and his followers attempted a coup d’état, known as the Beer Hall Putsch, in downtown München. The failed coup resulted in a conviction for treason and imprisonment at Landsberg Prison, during which time he wrote his memoir, Mein Kampf (My Struggle). 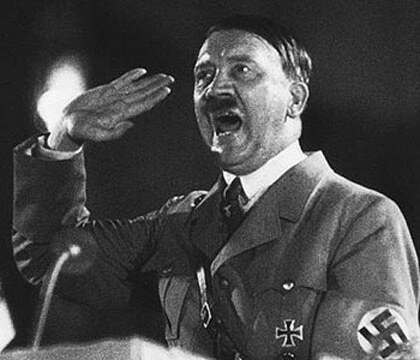 After Hitler’s release from prison in 1924, Hitler gained popular support by attacking the Treaty of Versailles and promoting Pan-Germanism, Anti-Semitism, and Anti-Communism through the use of charismatic oratory, superb organizational skills and Nazi propaganda. Slowly, but surely, the Nazi Party gained traction. After his appointment as Chancellor of Germany in 1933, Hitler transformed the Weimar Republic into the Third Reich, a single-party dictatorship based on the totalitarian and autocratic ideology of Nazism. Now as Führer and Reichskanzler, his public aim was to establish a New Order of absolute Nazi German hegemony in continental Europe. His private discussions revealed Hitler’s foreign and domestic policies that had the goal of seizing “living space” (Lebensraum) for the Germanic people in Eastern Europe and Russia. Hitler directed the rearmament of Germany, the annexation of Austria and Czechoslovakia and the invasion of Poland by the Wehrmacht in September 1939. These actions led to the outbreak of World War II in Europe. Under Hitler’s rule, in 1941 German forces and their European allies occupied most of Europe and North Africa and invaded Russia. The Nazis “Final Solution,” the destruction of the European Jews, accelerated at this point. By 1943, Hitler’s military decisions led to escalating German defeats. In 1944, the Western Allies invaded France and the Soviet Union reached Poland in the east. In 1945, the Allied armies successfully invaded Germany. In the final days of the war, during the Battle of Berlin in 1945, Hitler married his long-time mistress, Eva Braun. On April 30, 1945, Hitler finished dictating his final testament and the pair committed suicide, Hitler by biting down on a cyanide capsule, while simultaneously shooting himself in the head with a pistol, to avoid capture by the Red Army. SS troops doused the corpses with gasoline in the garden of the Reichs’ Chancellery and burned the corpses. Rumors persisted for three decades that Hitler had fooled his enemies and had fled to South America, but all the stories proved false. “These women are so oddly primitive. A hairdresser, clothes, dancing, theaters can distract them from any serious activity.